It has been hard to take the news that J-28, a 23-year-old female killer whale named Polaris, is now missing and presumed dead — even though I knew this news has been coming since August. It now appears likely that her 11-month-old son J-54, named Dipper, will not survive either. On Oct. 2, J-28, named Polaris, was photographed with an indentation behind her blow hole, a condition known as “peanut head” and related to malnutrition. Her 11-month-old son, shown with her, also was struggling to survive. Polaris has now been confirmed as dead, and researchers say her son is probably dead as well. I sadly reported on Polaris’ “super-gaunt” condition in Water Ways (Aug. 24) after talking to Ken Balcomb of the Center for Whale Research. Until recently, various whale-watching folks, including CWR researchers, have reported that Polaris was still alive. She was generally seen moving slowly and in poor shape, but at times she seemed to have more energy, raising hopes that she might recover. But the last sighting of Polaris was Oct. 19 in the Strait of Juan de Fuca. During a press conference Friday, Ken announced the death of Polaris, as he spoke out to raise awareness about the plight of Puget Sound orcas. Ken said Dipper’s sister and aunt were attempting to care for the young orphan, but no other lactating females have moved in to provide milk, so he likely will die if he is not already dead. Ken read a personally penned obituary for Polaris, noting that she was popular with whale watchers, in part because she was easily identified by a nick in her dorsal fin. She acquired the distinctive mark when she was nine years old. At the press conference, Ken talked about the most concerning problem facing the orcas: a shortage of chinook salmon, their primary prey. The food shortage is exacerbated when the whales burn fats stored in their blubber, causing the release of toxic chemicals from their blubber into their bloodstream. Chemicals can affect the immune and reproductive systems, as well as other hormonal systems. For Polaris, the problems began about the time her youngest son was born, and Ken speculates that she probably suffered from septicemia, an infection of the blood caused by bacteria entering her body during or shortly after the birth. Unless a carcass is found, we may never know for sure what killed Polaris. But I have written extensively about the risks that killer whales are facing in our local waterways, including those connected to food supplies, toxic chemicals and immune disfunction. A piece titled “Killer whale miscarriages linked to low food supply” was published in July in the Encyclopedia of Puget Sound. A story describing disease as an ecological force in orcas and other species was published last January. Both stories mention how chemicals can affect the immune system. 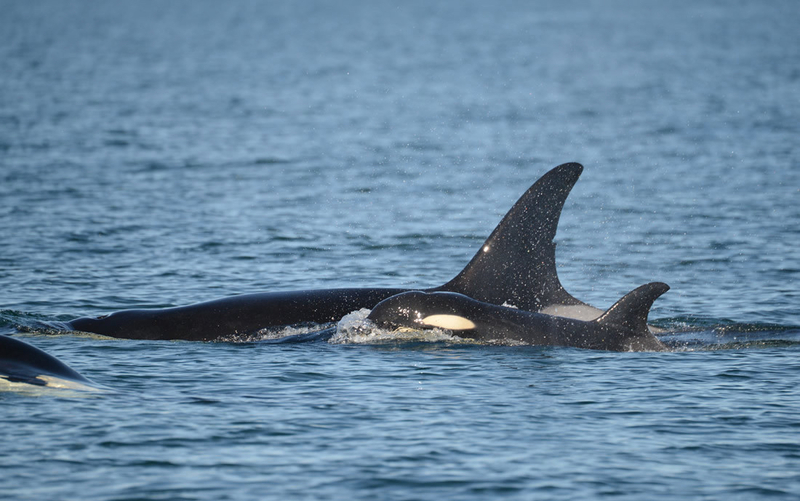 With the death of Polaris and presumably her son, the total number of wild Southern Resident orcas has dropped back down to 80, after reaching 85 during a “baby boom” of nine births between December 2014 and December 2015. Polaris’ son Dipper was the last calf born during the “boom,” and none have been born so far this year. Ken and others at Friday’s press conference — including Jim Waddell (YouTube), formerly with the Army Corps of Engineers — talked about the need to increase the population of chinook salmon. (See video this page.) One of the fastest ways to do that, they said, is to tear down the Snake River dams to bring more salmon returns to the Columbia River. The mouth of the Columbia is one of the primary feeding grounds for the Southern Resident orcas during winter months. “I’ve spent most of my life in a science community,” Ken said during Friday’s event. “We don’t basically speak out. We publish stuff and educate that way. I am of the firm conviction now that we are just going to study these whales to death, measure them to death, to extinction.